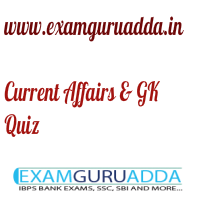 Dear Readers Examguruadda.in presents Current Affairs quiz of 13-14th December 2016 that cover important current affair events. Current Affairs quiz for IBPS PO,clerk, RRB-Po,Clerk, SBI, NIACL,Railways and SSC Exams. 1. Who has won the World Billiards (150-Up format) Championships title? 2. “Fengyun-4” an advance weather satellite has been successfully launched into orbit by which country? 3. Which Bollywood personality has been appointed as the UNICEF’s newest Global Goodwill Ambassador? 4. The Asia Pacific Ministerial Conference on Housing and Urban Development (APMCHUD) has started in which city? 5. What is the India’s rank in the defence spending, according to the recently published 2016 IHS Jane’s Defense Budgets Report? 6. . The book “Many Everests: An Inspiring Journey of Transforming Dream into Reality” has been authored by whom? 7. Who has won the 2016 ‘Most Improved Player’ award by the Badminton World Federation (BWF)? 8. The book “The Other One Percent: Indians in America” has been authored by whom? 9.India’s largest indoor sports arena will come up in which State? 10. Name the biography of gymnast Dipa Karmakar that released recently?